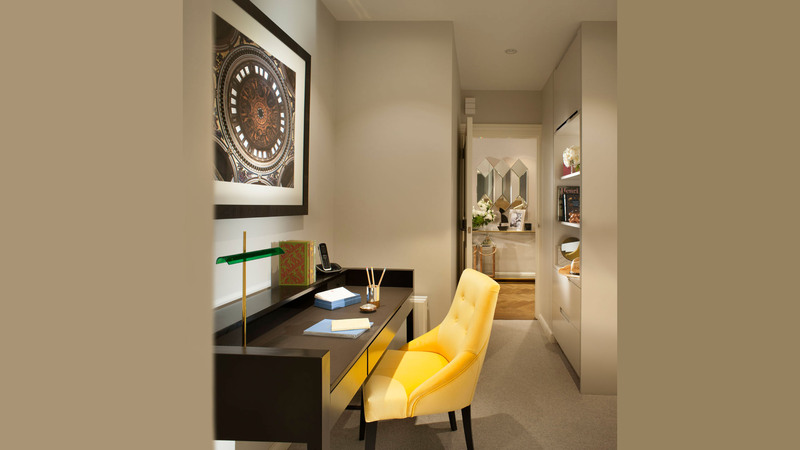 TG Studio were tasked to reimagine this 1970’s two bedroom apartment near Buckingham Palace in the heart of Central London for a Hong Kong based family. 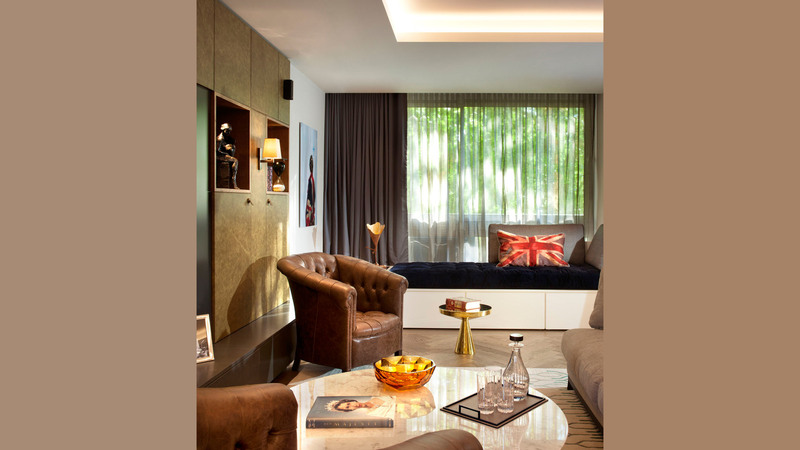 As their international base, their brief was to create a thoroughly British feel for the property – from the furniture and accessory selections to the finishes throughout. 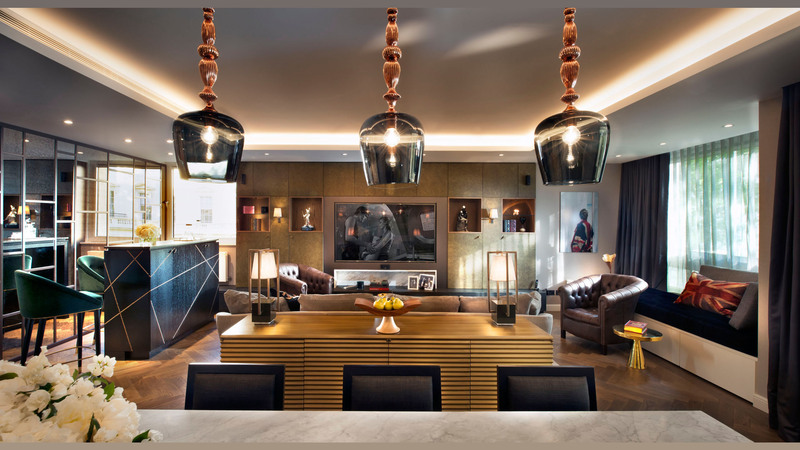 The end result is a stunning home away from home for a client who has it all. 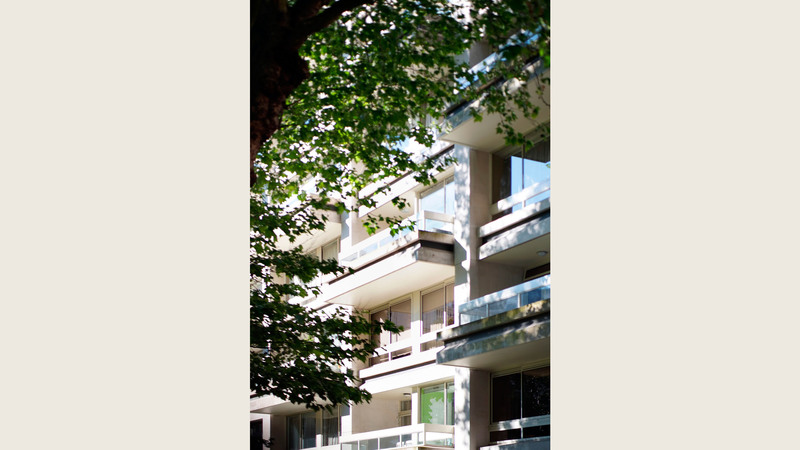 The apartment was completely stripped back to a bare shell before being reconfigured to suit modern life. A generous entrance foyer separates the entertaining and private spaces, with the two large bedrooms sharing a secluded study area in the hallway. 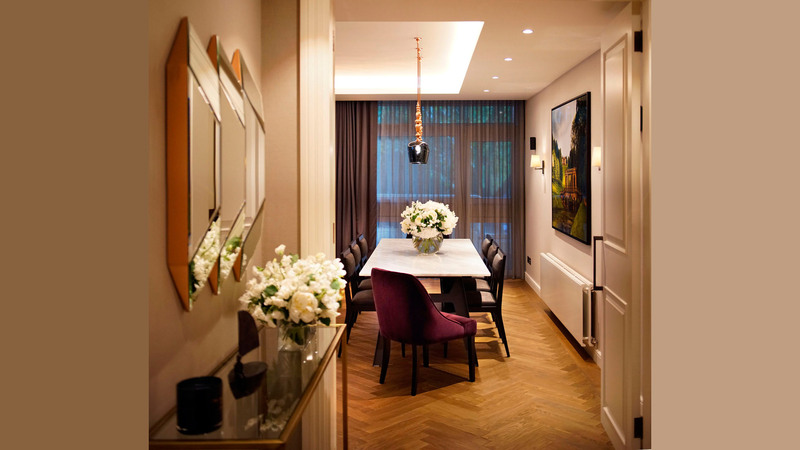 The entrance foyer is simply furnished and contains a mirror designed by Thomas Griem. 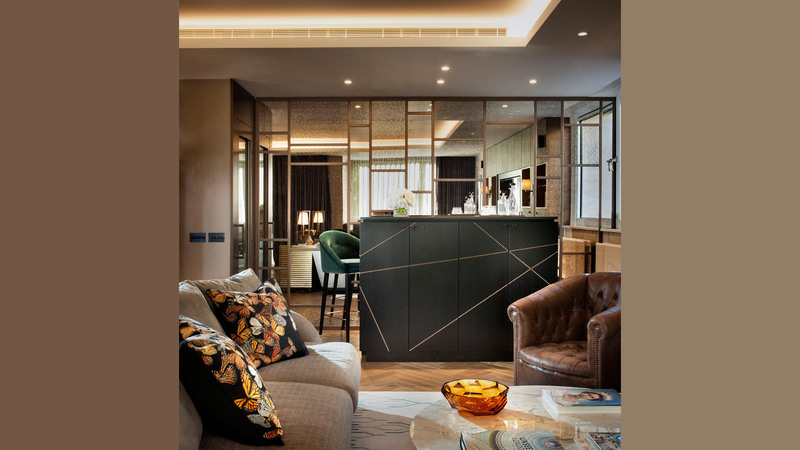 Called the Origami mirror, the various facets capture and reflect different views of the apartment as you pass into the combined living and dining rooms. From the parquet flooring to the lighting and down to the paint on the walls, British companies and suppliers were used where possible. Simplicity was again the key in the kitchen, where TG Studio replaced the dated kitchen with an elegant and functional white kitchen. Warm tones and varying textures were used throughout the master bedroom to create a cozy, inviting space perfect for relaxing. The luxurious linen wallpaper was sourced from Stereo Interiors to envelop the space, here combined with plush carpet and generous furniture. 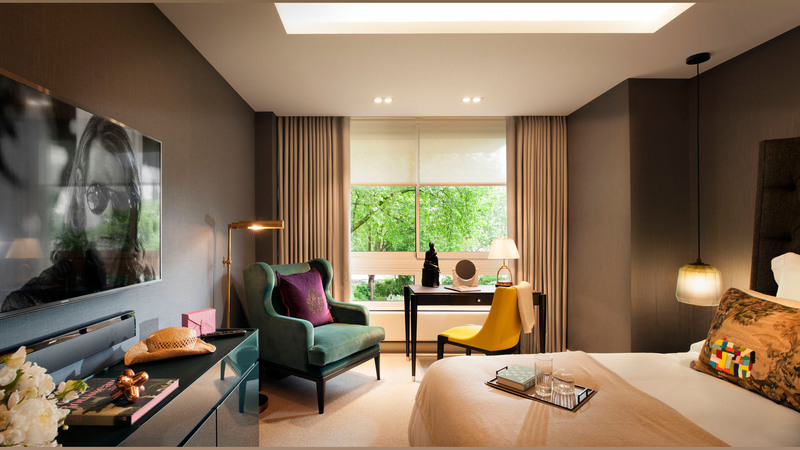 Atmospheric lighting is provided by a pair of pendant lights from Holloways of Ludlow which flank the super-king Thurman bed from Meridiani. The rich woollen fabric used on the bed offsets tactile smoking room velvet used on the classic Amy Somerville Wing chair. 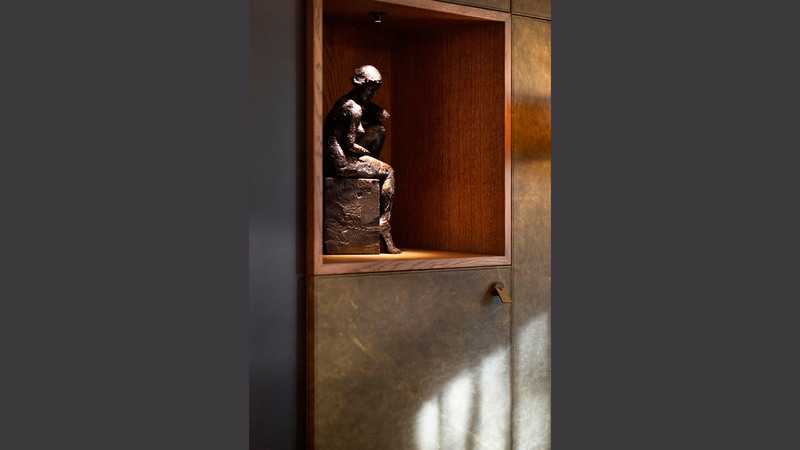 A clever reconfiguration of the master suite allowed TG Studio to create a new walk in wardrobe incorporating bespoke joinery handcrafted in London. Here, cedar wood has been used throughout which emits a clean, crisp scent perfect for a wardrobe. 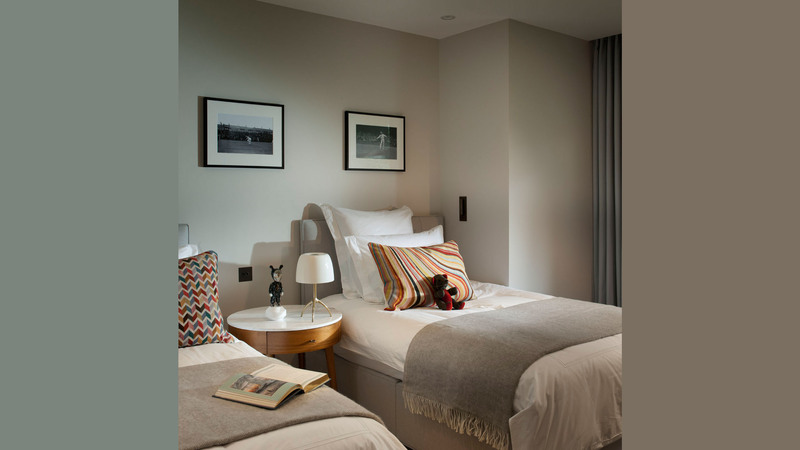 The second bedroom houses a pair of customised double beds layered with English linen and offset by Paul Smith cushions which bring added colour and texture into the room. Discrete wall mounted lights beside each bed allow the children to read at night whilst the marble topped night stand is generous enough to hold a beautiful Foscarini lamp along with a collection of books. The teddy bear was a gift for the client’s youngest son on his first visit to London and now follows the family around the world. 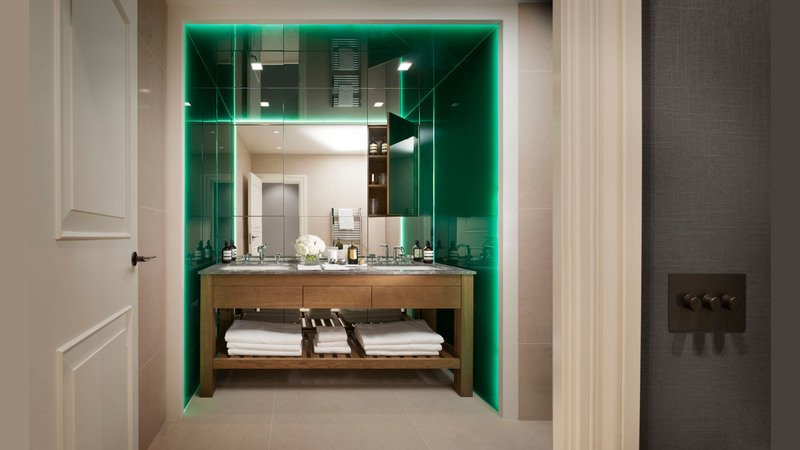 The calm and relaxed master bathroom features a wide double vanity recessed into the wall and is surrounded by edge-lit glass in British racing green. 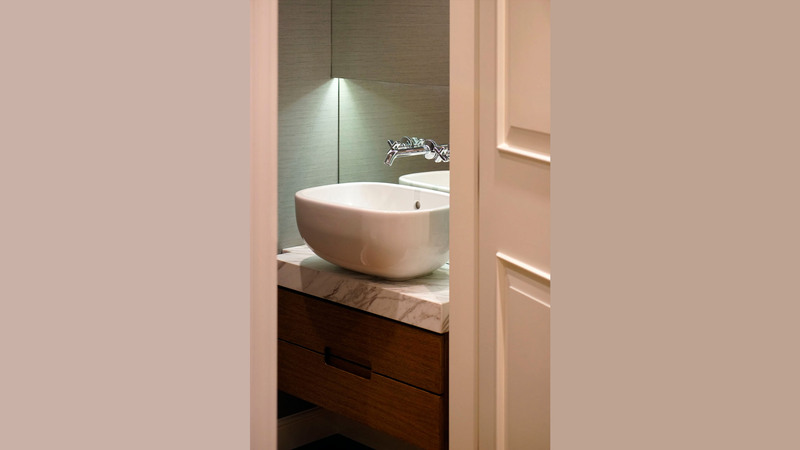 The deep recess, combined with full height mirrors behind creates an impressive sense of scale. 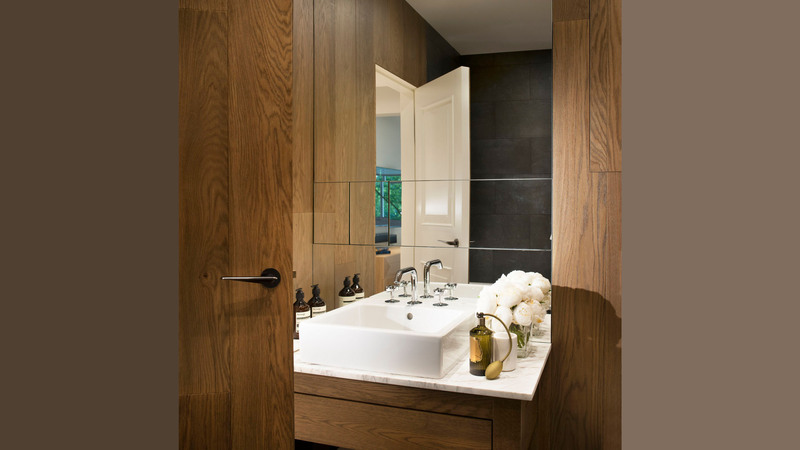 Clean lines flow throughout both bathrooms, each with concealed storage behind the mirrors and fittings from Waterworks provide a timeless luxury to the space. 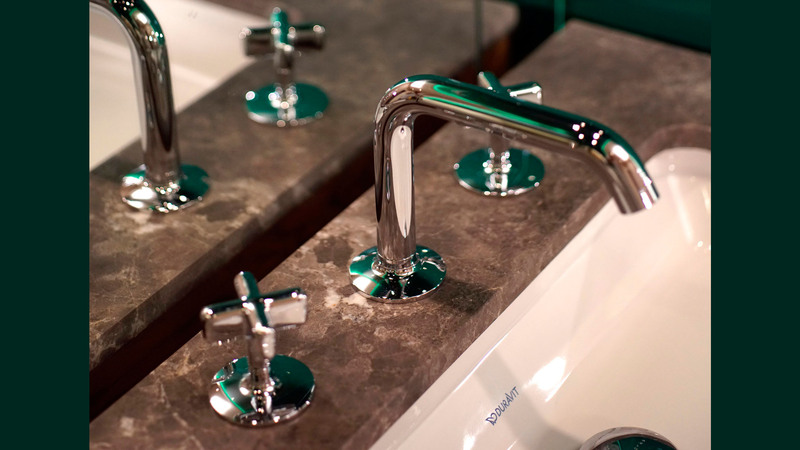 Forbes and Lomax produced the switches and sockets for the entire property, as these are constantly being handled and used we like the feeling of quality that the solid metal provides.